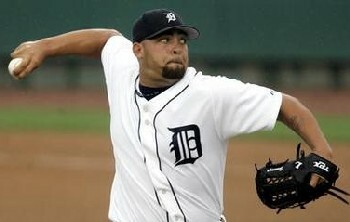 Joel Zumaya has recently been having shoulder problems. The root cause of his problems is revealed in the video clip below. What you see in Frame 32 is significant Hyperabduction, where Joel Zumaya's Pitching Arm Side (PAS) elbow gets both above and behind the level of his shoulders as in the two photos below. 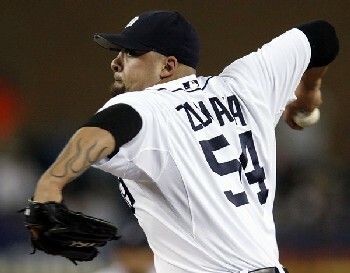 This Inverted V arm action creates a significant timing problem (aka rushing) such that Joel Zumaya's shoulders start rotating well before his PAS forearm is vertical and in the high-cocked position.